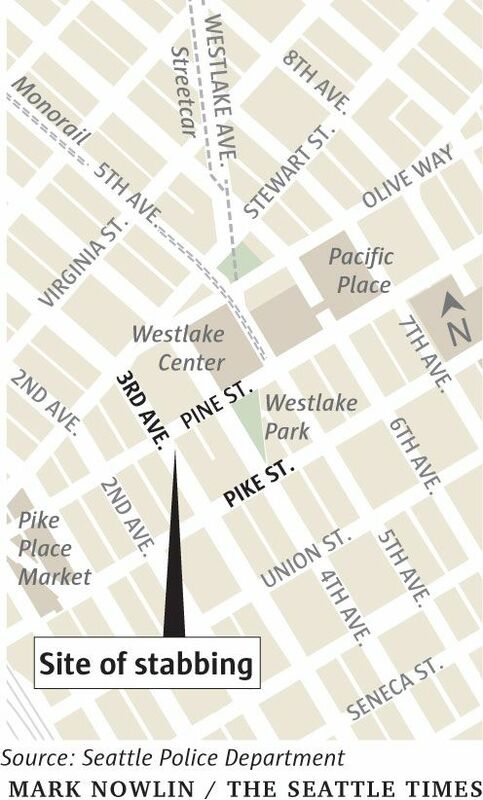 A man in his 20s was taken to Harborview Medical Center in critical condition Monday afternoon after he was stabbed numerous times near Third Avenue and Pine Street. Seattle Police said the stabbing, which happened about 4:25 p.m., “does not appear to be random,” and that the victim may have known the suspect. The two men then walked around the corner, and moments later, said police, a witness ran up to the officers to tell them someone had been stabbed in front of the McDonald’s. The two officers said the victim was bleeding from his arm and gave him first-aid until medics arrived, who determined the man had been stabbed multiple times. The police Gang Unit is investigating. 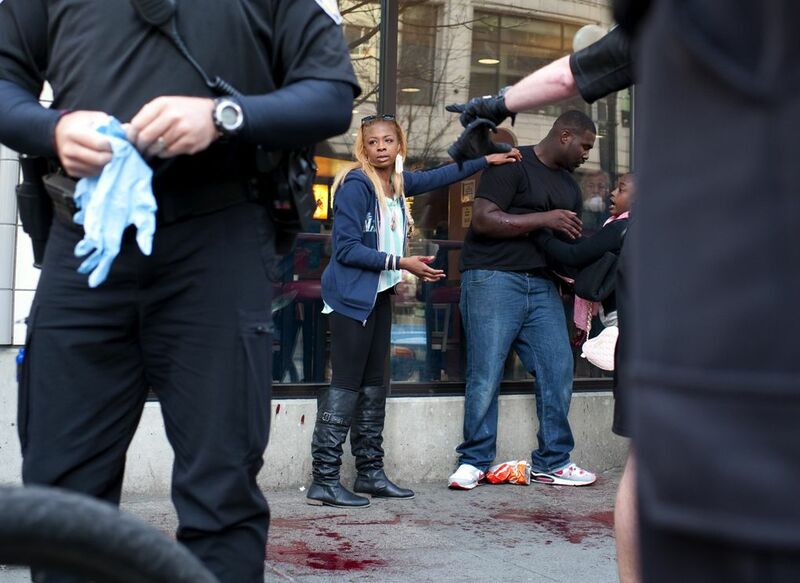 The photo of the victim was taken by Michael Barkin, a media coordinator at Corbis Images, who happened to be near the scene. The suspect is still at large, said police, and described him as a thin male with medium skin tone, 20 to 25 years old, 5-foot, 9-inches tall, and last seen wearing a black baseball hat with red insignia, a red shirt, brown hooded sweater with block lettering and black pants. Police said anyone with information about this incident or who may know the identity or whereabouts of the suspect is asked to call 911 or Seattle Police and refer to this incident. Anonymous tips are welcome, said police.